A clear sky. Low 38F. Winds SE at 10 to 15 mph..
A clear sky. Low 38F. Winds SE at 10 to 15 mph. An employee with contractor Kraemer North America talks to a local resident during an open house discussing upcoming construction on the I-25 South Gap Project. Soon, the south section spanning Greenland Road to Monument will get underway as part of the expansion project that is scheduled for completion in 2022. Robin Barnhart has been through the inconveniences, and ultimate rewards, of major construction in his backyard before. First witnessing a massive project in Salt Lake City and more recently with the T-REX endeavor in Denver, the new Monument resident knows the road ahead is long and fraught with day-to-day struggles but can’t help but look ahead to the completion of the I-25 South Gap Project. 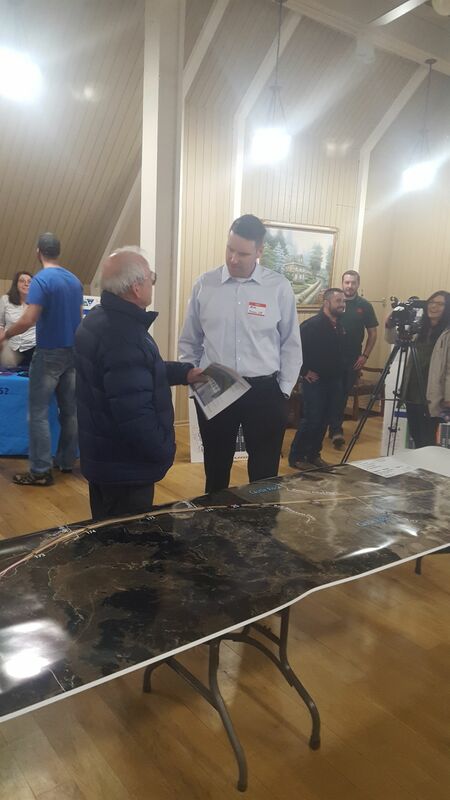 The Colorado Department of Transportation held an open house Thursday at the Woodmoor Improvement Association Barn so residents could talk one-on-one with project experts about how upcoming construction will affect them. Since construction began in September 2018 on the 18-mile, $350 million project, roadwork has focused on the 5-mile northern section between Plum Creek Parkway in Castle Rock southward to Sky View Lane/Tomah Road that will create new lanes in the median. But look out northern El Paso County, because not long from now, work will begin on the 7-mile section that spans Monument to Greenland Road. Highlights of this portion of the Gap include new lanes, three wildlife crossings and a bridge culvert at Greenland Road. To build a new wildlife crossing, Monument Hill Road at Misty Acres Boulevard will be closed for at least four months. Access to Colorado Heights Camping Resort and Palmer Ridge High School will remain open with detours in place. In addition, overnight lane closures and extended closures of the Greenland Road and County Line Road ramps and Monument Hill Road will be required for safety-critical work, according to a CDOT fact sheet. Despite its three-year timeline, some are just giddy at the thought of a three-lane road connecting Castle Rock and Colorado Springs. After all, the project was years down the road until it recently received a $65 million grant from Federal Infrastructure for Rebuilding America. Additional funding was provided by Douglas County ($10 million), El Paso County ($15 million), Pikes Peak Rural Transportation Authority ($10 million) and CDOT ($250 million).